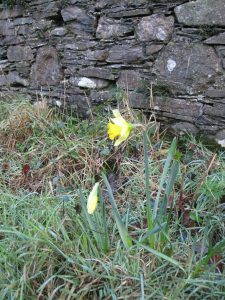 There have been daffodils flowering on a verge in High Lorton since New Year and I understand they have featured on the BBC Weather! Christmas and New Year seem a long way past now. All the family came to stay at Foulsyke which was lovely particularly with the two new arrivals. I am now extending my range of walking to those that are buggy friendly and we tested Ella and Poppy’s buggies to their limits – and beyond! 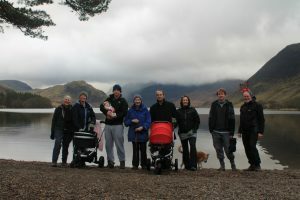 We walked down to Crummock on Christmas Day (along with many others) but the buggies were too wide for the bridges so we had to take the wheels off to get across! Another day we had a lovely walk along Derwentwater shore returning along the Catbells terrace path: this included a picnic with a view! However on New Year’s Day we got somewhat bogged down on a rather heavy path at Wasdale Head! On the Cottages front, I had my annual inspection in December: I maintained my Five Star status with Gold Award in all cottages and again scored 100% for cleanliness. When the inspector went into Buttermere bathroom she declared that she didn’t think she had ever been in such a clean bathroom! However we are now into January and working on the Cottages before the start of this year’s season. The main focus is on Buttermere and downstairs in Loweswater which are being redecorated and having new carpets and heaters. 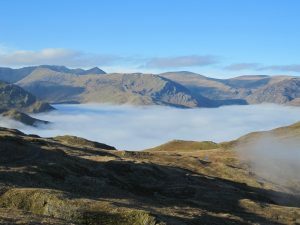 Judy and I had a wonderful experience on Thursday on our first walk of the year: we had decided to walk up to Angle Tarn Pikes and Brock Crags from Patterdale. 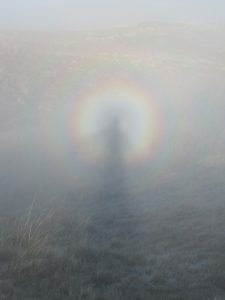 We walked up to Boredale Hause in cold mist and as we reached the hause we came out into sunshine with the cloud below and suddenly as we walked across the top we were aware we were experiencing brocken spectres – amazing! I had never seen one before and it was so exciting! The rest of the walk was good too as the cloud inversion was extensive and very beautiful and we sat and ate our lunch in glorious warm sunshine on the top of the Pikes.